The May solicits for DC Comics came out and there are a few happy surprises for me sprinkled in the month. In particular, I am looking forward to the Supergirl main title. With Cyborg Superman behind us, it looks like writer Steve Orlando and artist Brian Ching are going to dive into the deep end of the DC Universe And that makes me happy. As I said, this arc looks like it is going to be great fun. 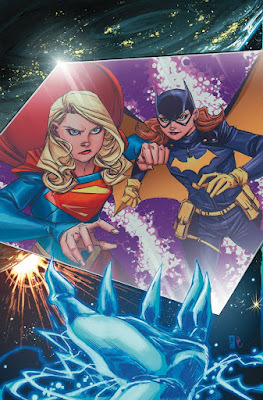 Supergirl and Batgirl teaming up! That alone is worth it. Throw in the Emerald Empress and this Legion fan is smiling. Add the Phantom King, a nice link to Kara's Krypton past, and I am thrilled. Supergirl Being Super #2 came out last week and was a very moving chapter in this Elseworlds take on Kara Zor-El. Mariko Tamaki is known for her coming of age stories and this seems to fall into that mold. There are super-powers and Kryptonite and S-shields on blankets. But really this is a story about life changes for this Kara. Last issue seemed to concentrate on the awkward feeling of 'otherness' that most teens feel. People are defined in few words. The jock. The feminist lesbian. But Kara doesn't seem to know who she is. Add the layer of otherworldliness to her and you definitely have someone trying to figure out their place in the world and where they are going. But even the characters who seem to have it figured out, like 'Jen the Jock' still have all these insecurities and questions. What if they aren't who they think they are? I don't know any teenager who didn't have these questions. Heck, I still ask myself some of them. This issue seems to be all about grief. We start with a tragedy. And then we see the emotional fallout. How do people respond? Do they reach out? Or retract from the world? Do they openly weep? Or become withdrawn and seemingly numb to the world? It is Kara who we see struggling with her feelings and we see her interact with everyone else. Toss in the superheroics and it is a heavy and well conceived book. The art on the book is brilliant stuff by illustrator Joelle Jones with vibrant colors by Kely Fitzpatrick. Jones continues to shine, bringing in kinetic panels of action with some slightly warped anatomy and perspective to accentuate matters. But the quiet sad scenes also really explode of the page as well. Wonderful stuff. Action Comics #974 came out this week and really ramped up one of my favorite recent storylines, the mystery of the new Clark Kent. Who is he? Where did he come from? I have a couple of theories ... a Mr. Oz creation, a normal human changed by a discharge of super-energy by the dying New 52 Superman, even some version of Matrix on this world ... but they are pure guesses. 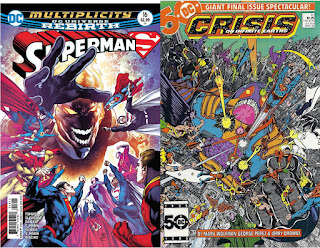 If writer Dan Jurgens has dropped any significant hints, I have missed them. What is clear is that this Clark is more than what he says he is. And the way he has been drawn in certain panels gave him something of a malevolent feel. This issue puts that sort scary behavior on display for us front and center. This Clark has a temper and doesn't like to be made a fool of. Do I have a better guess at who Clark is after this issue? No I don't. But I do know I am a little more frightened of him. And I am even more intrigued! That makes me happy! The Clark mystery isn't the only plot in this issue. We get more of Superwoman's recovery and we get a new thread in the re-emergence of Blanque as a threat. So this certainly felt like a full issue, in a very good way. Patch Zircher and Steve Segovia (with Art Thibert inks) split the art here. Zircher's work on the Lois/Clark pages are just wonderful. Zircher really gives us a wonderful Lois. And, as usual, his page layouts guide the reader's eye nicely. Segovia gets a bit of a more comic world canvas to work on with Fortress settings and alien armor. The different art styles on the differing locales made the whole thing feel pretty slick. For me, the best thing about this issue was the slow turn of the fake Clark from mild mannered, clumsy, nice guy to scary threat. And nothing conveys that more than this cover by Gary Frank. Clark lurking in the background is eerie. This looks like a horror movie poster. Last issue ended with a dying Lana being brought to the Fortress to be saved. Initially, it seems like nothing will be able to help Lana from death. 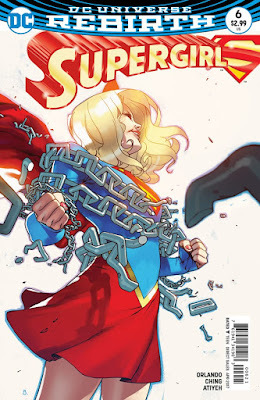 I am assuming that this takes place immediately after the end of Superwoman #7 when Lana just defeated Lena. 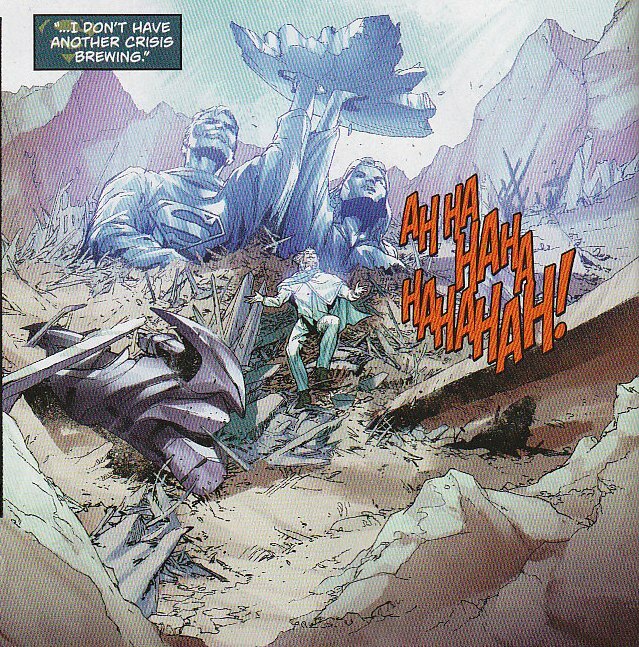 And I suppose the 'I just saw you there' comment would be because she saw Clark frozen in one of Lena's chrono-cubes. 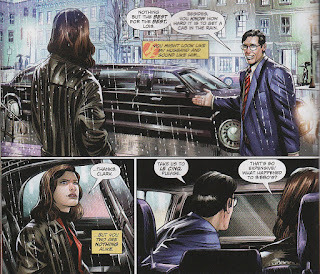 But that doesn't make sense if Lois is about to go out on that date with Clark, set up in an uneffected Metropolis. So maybe this is after some other Superwoman adventure? But that doesn't sit right with me either. These are the things that a group editor is supposed to oversee. Meanwhile, Lois has set up something of a creepy wall about this new Clark. She is trying to figure out just who he is (aren't we all!!!). And she realizes the only way to get closer to figuring it all out is to get closer to him. We see her preparing for this date with Kent. Zircher shines in these quiet moments of Lois getting ready. But Jurgens gives us all these new facts about Clark's backstory. His birth parents died in an explosion (interesting) and he was adopted by the Kents. But really what I want is a little more. How deep does this conspiracy go? Are there adoption papers? I suppose with Superman dead, all the existing Clark photos or papers could be attributed to this guy. Clark shows up for the date ... early. Usually I would chalk that up to a faux pas or a pre-date nervousness. But somehow it comes across as a little bit dark. Was he trying to catch Lois in something? Or catch her off guard? He then leads her out to an idling limosine. Whoever he is, he doesn't have the 'down to Earth' style of the real Clark. Lois says it. The limo heads to an expensive, exclusive restaurant. And inside, Lois is led to a private room, extravagantly decorated. And then Clark proposes! Proposes!! Boy, this Clark has acted close enough to the real thing before this issue to have me perplexed. Even I have wondered if he might somehow be a version of the real thing. But this display? And the quick proposal? Meanwhile, when all Earthly treatments fail to stabilize Lana, Clark turns to otherworldly cures. If her powers are somehow Kryptonian based, maybe Kryptonian medicine will help. 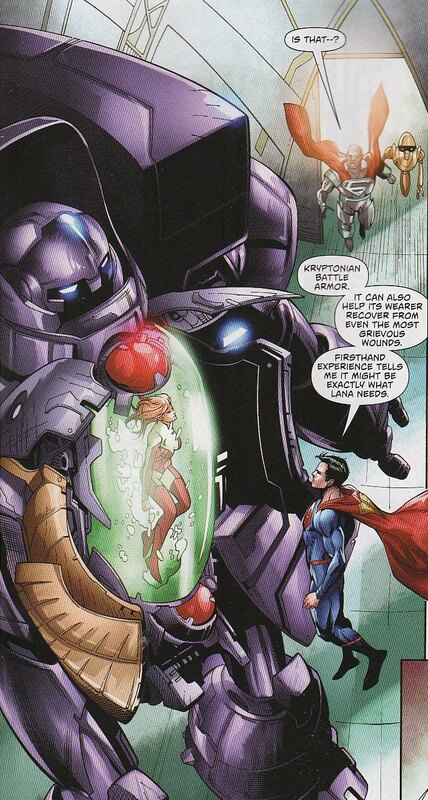 In a nice look back at history, Superman puts her into his old Battle Armor. That suit has a sort of fluid matrix healing egg chamber. Thankfully, once inside, Lana stabilizes. It is a nice callback to the Return of Superman arc from way back when. Given that Dan Jurgens was one of the drivers of that historic story, I guess it isn't a big surprise to see it mined again. In that story, the 'dead' Superman did stay in the fluid healing chamber of Kryptonian Battle Armor while recovering from his fight with Doomsday. Lois, of course, walks out on Clark after his proposal. She wants nothing to do with it. And he seems genuinely surprised. Some of what he says is interesting. One, he promises to be good. That is an odd statement. Does he mean as opposed to being evil? That he won't do something wrong? It just sticks out as strange language. But he also says that he feels they need to be together. Is he channeling the history of the real Clark? Does he sense they should be married? That would be specific to the current Clark and not necessarily the dead New 52 Superman who never really clicked with Lois. This made my theory about an energy avatar Superman both more and less likely. 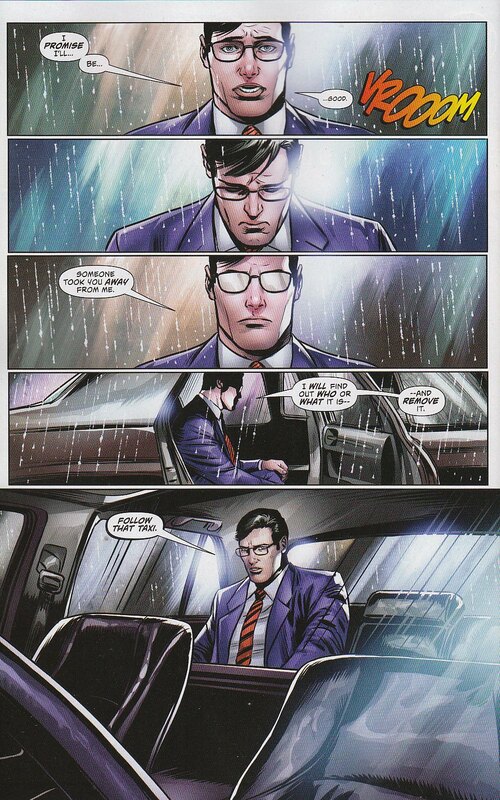 When Lois leaves, the tone of Clark changes. And things get a little creepy. First off, there is that line again about being good. Weird. But then things change and Clark seems to dehumanize. Suddenly you don't see his eyes through his glasses anymore. He is something else. That look of confusion becomes a stern look, an angry look, a scary look. He vows to destroy who gets in his way. Best page in the book! I've been ignoring one of the subplots coursing through the issue. Early on, Superman gets notified that Hank Henshaw's group is breaking into the Himalayan Fortress. However, his devotion to Lana and his confidence in his defenses lead him to stay in the Arctic. I don't quite know how Henshaw's agent gets past the vaunted defenses but he does. And he is telepathic controlled to release the ultraviolent psychic Blanque who quickly blows the whole thing up. In some ways I'm happy. The two Fortress world was confusing. Glad we're consolidating. And Blanque was a big threat in Lois and Clark. He is a big threat. I'm excited to see what happens next. Back in Hamilton, the Whites have a standard family dinner. 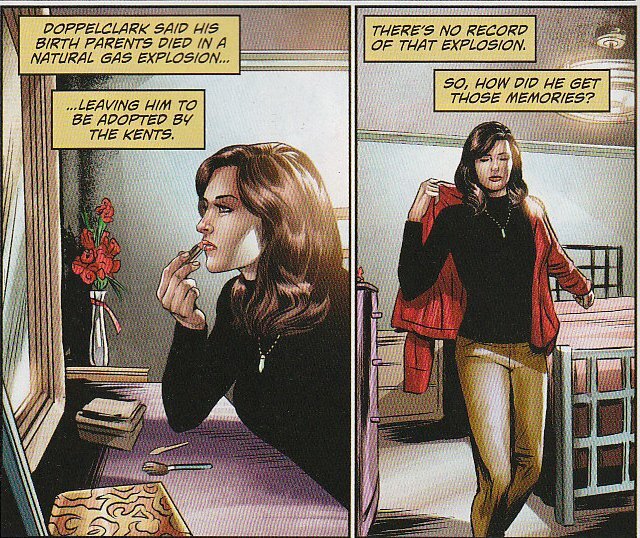 What is interesting is that Clark downplays what he did with Lana. And Lois doesn't even mention what she did with 'Clark'. It is odd to see these two maybe hold back on the truth. 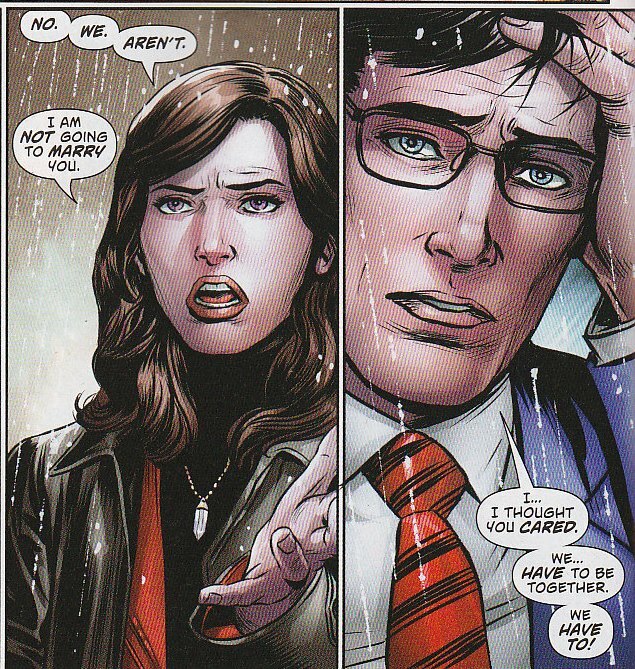 Maybe Lois thought that her Clark might be unhappy with the chance she took? Maybe Clark doesn't like to talk about any Lana with Lois? Or maybe they just don't talk business in front of Jon? Unfortunately the doppelgänger Clark followed Lois. He sees the real Clark and Jon and knows they are with Lois instead of him. Suddenly this Clark looks outright violent. And blue energy spills out from behind his glasses. Does that make him more of a Dr. Manhatten construct? Whatever he is, he is terrifying. Great cliffhanger. I will say, if my guess of Mr. Oz being Vyndktvyx turns out to be true than this Clark could be a simple 5th dimensional construct. But I simply don't know. In case you can't tell, I loved this issue. This 'Clark' plot grabbed me from the beginning. And this issue pushed the pedal all the way down. We are t seeing the well intentioned buffoon in this Clark. We seeing someone unhinged and almost unreal. What is he?? And the art shows that subtle transformation perfectly! Dang, I love a good comic mystery!! DC Superhero Girls has entered its third season of shorts on their website. As I noted in past posts, it seems this season will be something more of an ongoing show with running plots as opposed to silly one and done episodes. And we didn't have to wait long for this to be apparent. The third episode of the season is called 'Tales from the Kryptomites, Part1'. The very fact that it says part one shows the website is thinking more long form while not heading more into feature length DVD films. I also love that Supergirl seems to be a central part of this arc. The main bad is Lena Luthor (or perhaps here Lena Thorul)! And clearly that history of being a Luthor is part of the plot. I also like some nods to the past within the episode (although I admit that I might be reaching here. And we end on a nice cliffhanger, making me want to come back. Go ahead and can watch the episode here. In the meantime, here are my thoughts. I have been eagerly awaiting Supergirl episode 213, titled 'Mr. and Mrs. Mxyzptlk' for some time and for many reasons. For one, as a big Mxyzptlk fan, I knew this would be a wild episode filled with craziness and fun. 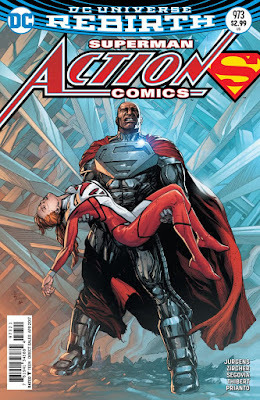 But I also knew that Supergirl comic writer Sterling Gates (along with Jessica Queller) was writing it. If anyone has proven they understand Supergirl, it is Gates who has written some definitive stories about Kara. Gates is also a huge comic fan. And I thought (and was correct in thinking) that this episode would be filled with comic references and homages. Just think back to his digital Adventures of Supergirl comic which was set in this continuity and touched on just about every age of Supergirl as well as comics in general. But there is more to this episode then just 5th Dimensional romantic hijinx. We get progression of all the romantic subplots of the series and even the beginning of another. That's perfect for a Valentine's Day episode. I don't know if I agree that Kara would fall for Mon-El ... but the chemistry between Melissa Benoist and Chris Wood is undeniable. And Mon seems to be striving to be better which I gues works in his favor. The best thing for me about this episode is that this is a pure Supergirl adventure. No one else really comes in to save her. She both outsmarts and outpunches all her foes. And she handles herself with confidence and strength. Just last episode I complained about J'Onn needing to come in and save her. No such scene here. Kara deals with all the emotional and super-heroic stuff all on her own and comes out victorious. Of all the great things buried in this episode, that is the shining star above it all. Before the episode, I told myself I would need a pad at the ready to write down all the references. I was right. News from the New York Toy Fair 2017 was released this last week and once again Supergirl has been well represented. As I have said for a while now, I am still a bit surprised to see Supergirl as popular as she is these days. It makes those lean years seem a distant memory. You can find tons of coverage of the Toy Fair but I include some links where I obtained the pictures I am posting here. 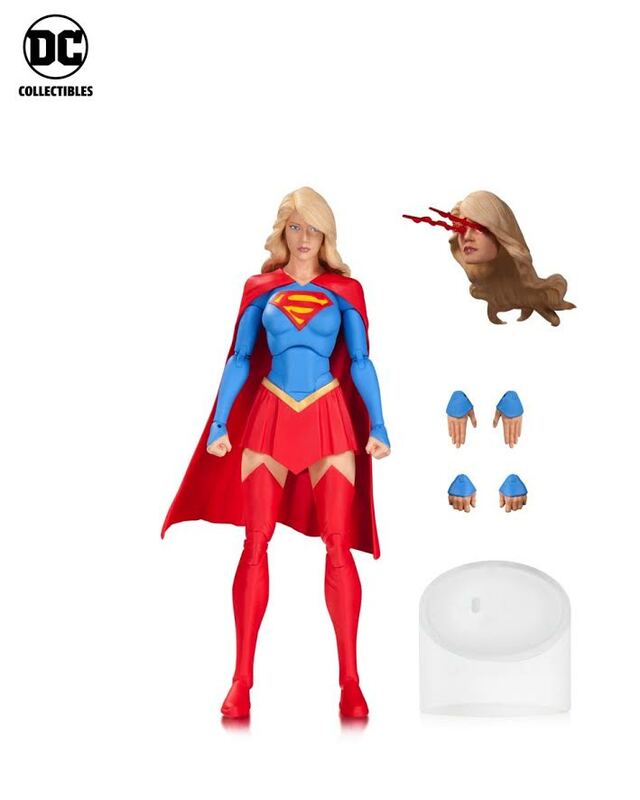 Above you see the Supergirl Rebirth action figure which will be released some time this year. I think this is a great figure. I have always been a fan of the Rebirth style as it has so many of the elements I look for in 'my' Supergirl costume. But throw in a heat vision head and multiple hands? True bonus! Can't wait for this one. 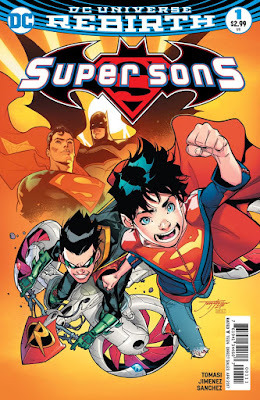 Supersons #1 came out last week and was exactly the fun sort of romp that I thought it would be. If people think that Batman and Superman would have a hard time being friends, they should read the interactions of the two young heroes Robin and Superboy. Damien's abrasive personality, flaunting of rules, aggressive heroing, and and overall superiority complex contrasts wonderfully to Jon's rule-following, optimistic, and otherwise good behavior. How and/or why would these two hang out? While those personalities seem to clash, both are young legacy heroes trying to figure out who they are in this crazy world. There is more in common than not. So I can see why they would seek each other out as well. In my head canon, Damien is lonely and wants someone his age to pal around with. Writer Peter Tomasi does a great job in this first issue. We get a hint of an upcoming villain. We get a flashforward of a battle, a taste of things to come. And we get a compelling opening adventure which does a nice job of laying out who these characters are. When the issue was done, I wanted more. That is what a first issue should do. I have praised Jorge Jimenez's art in the past but he really shines here. His style is starting to get a little more daring in my mind. I am starting to get a sort of Chris Bachalo/Humberto Ramos sort of feel, a sort of bending of the art away from realism and into something more interesting. Super-entertaining and Bat-tastic. Count me in. Superman #17 came out this week, a one and done horror story focusing on Jon and Kathy and the dealings of the nearby Deadman's Swamp. In a current comic world of six issue arcs built for trades, I love the one and done. And I especially love it when it stands alone *and* builds on overlying arcs. In this instance, the Deadman Swamp plot point hadn't been touched on since Superman #10. And there is more hints that Farmer Cobb is more than he says he is. So this issue worked for me and worked well. 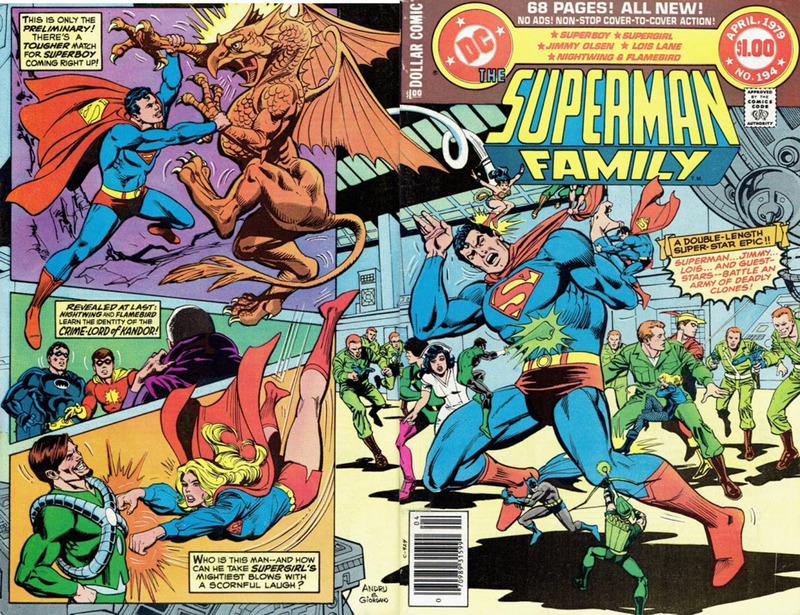 The Superman title has been the more family-centric title of the super-books, so focusing on Jon also was welcomed. There was a little bit of Stranger Things in this issue so I wonder if storytellers Peter Tomasi and Patrick Gleason were trying to plug into that zeitgeist. And the art by Sebastian Fiumara is perfect for the material. There is a sort of Bernie Wrightson feel to the proceedings. From the swamp surroundings to the moldering mansion to the monstrous animals, this really brought back echoes of the original Swamp Thing series. And that is always high praise. I have a couple of theories about the proceedings, better said during the review. But the idea of Deadman's Swamp is a nice wrinkle of horror in the otherwise sci-fi tone of the book. 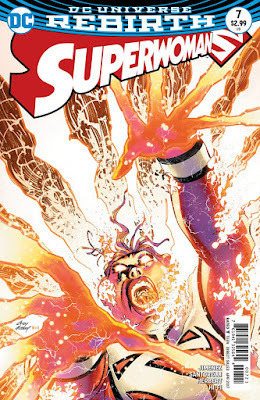 Superwoman #7 came out last week so I am a bit late in covering this issue. But in some ways, the time was needed. This issue is a super-dense and somewhat confusing closure to the first arc. I wonder if the story got away from writer Phil Jimenez. I have praised Jimenez in the past for packing a lot into his books, making them feel like two issues in one. But here I felt like there were so many threads being covered that I was feeling frayed as a reader. As all the characters and plots are being wrapped up, I found myself asking 'why'? Why did Lena need the temporal cubes? Why is she invading the Phantom Zone? Why is the suit called 'Insect Queen'? Why does the Atomic Skull demand an apology from Lex? Why doesn't Lex know how to reboot his armor? Why does Lana sound like she has been mistreated by all the men in her life? Why does the Gestalt ship need to change configuration? Why? When I ask that many whys, the story is lost on me. I also can understand that this book might be the title for Jimenez to look at feminism and that is fine. But I think that the downgrading of Lex and some of the speeches by Lana feel a little forced. I'd love a Lana story about feminism. I don't know if I need a feminism story with Lana as speechmaker. Maybe I am saying this too clunky. Maybe it is better for me to say that I would rather be shown the feminist slant than be told it. The art on the book is done by Jimenez and Jack Herbert. The two styles seem to jibe well with each other. And as usual, it is a packed issue with inset panels and great page layouts. Supergirl episode 212, titled 'Luthors' aired this week and was a decent episode, building up the threat of the Luthors and Cadmus, bringing back a couple of villains from earlier in the season, and shoring up one of the relationships that has suffered the most during this season - Kara and James. And, in continuing and running theme of this second season, we touch on prejudices and biases. For me, the most interesting plot involved the relationship between Lillian and Lena. We learn a lot about their family's history. We meet the other members of the Luthor clan. There is a nice understated current of the eternal argument of nature vs. nurture. There is a lot here to remind me that you can't trust a Luthor. And that bias is unfortunately played out on Lena who is trying to do good and distance herself from her family's legacy. But Luthor motivations are, to quote Churchill, a riddle wrapped in a mystery, inside an enigma. People just keep thinking there are ulterior motives. But I was definitely glad to see that some time was spent on the Kara/James friendship. It has felt, at times, this season that the show runners simply didn't know what to do with James. The Guardian plot felt a little forced at times. So seeing them at least voice their issues with each other and try to move past them was welcomed. I also liked hearing James add some Superman/Luthor context to his concerns about Lena. And we continue to nudge the Kara and Mon-El romance forward. In fact, we get just about as close to a kiss as we have before a surprise ending stalls things. Finally, I have to compliment Katie McGrath for her performance as Lena in this episode. She really has to emote a ton here, veering from sadness and worthlessness to a touch of anger and self-reflection. And she simply nails it. What a nice showcase for her skills. 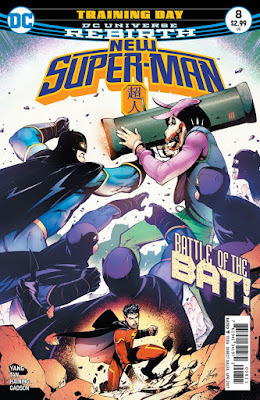 New Super-Man #6 came out last week and was another introspective chapter for the main characters of the book. After the first arc concentrated on Kenan accepting his powers, wavering with his loyalty to family and country, and starting the hero's journey. This brief 2 part story has Kenan taking the next steps on his journey. But it also gives us some backstory on Baixi, the New Bat-Man. In particular, I enjoyed this part of the arc more. This humanized Baixi and gave him something of a tragic subplot. This adds dimension to his character. Another thing that I am appreciating about this book is writer Gene Luen Yang updating Asian characters from DC's past. I am glad that Yang is looking at some of the clunkier portrayals of Asians in the past. So seeing I Ching as something more than a 'sensei' spouting fortune cookie wisdom is great. And the ending cliffhanger looks as though Yang isn't done. I wonder if we will see an updated and improved Wu 'Chop Chop' Cheng. He is due for a modern and more appropriate take. The art on this issue is again by Billy Tan and a love the fine lined and polished look of his art. This isn't the scratchier and rougher look of usual artist Viktor Bogdanovic. This feels organic and flowing and that works well with Ching's lessons. I hope he becomes the go to pinch hitter for this book. 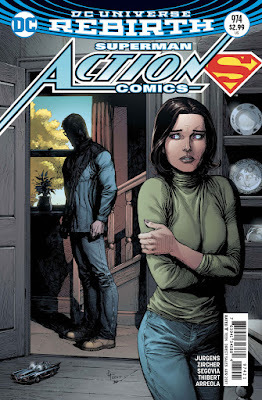 Action Comics #973 came out last week and was a great little rest issue after the God-Killer arc that preceded it. 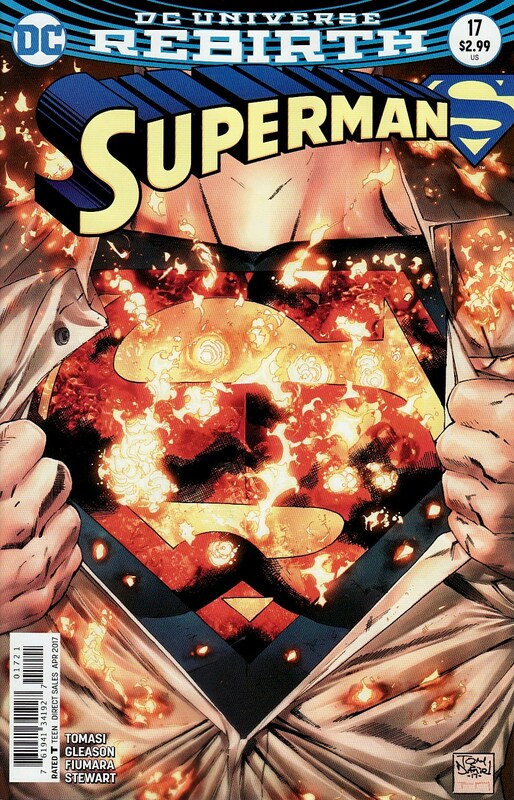 Superman took a bit of a back seat in this issue, allowing Lois the chance to truly shine. 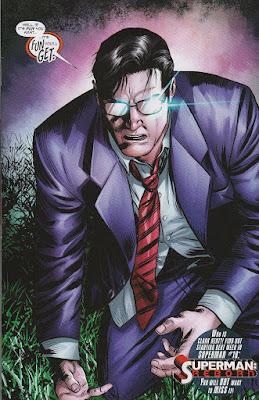 And this also gave us a much closer look at the mysterious Clark Kent. For someone who has found the Kent mystery fascinating, I liked it. For someone who has been craving a strong Lois presence in the DCU, I loved it. But as a long time reader, I couldn't help but feel that there was a wonderful Bronze Age patina to the whole issue. Maybe DC shouldn't be aiming their books at people of my age, a nearly elderly age bracket. There is no denying that there is something classic about this. And that is what #Rebirth was supposed to be about, getting back to the classic feel of these characters that have made them lasting. Writer Dan Jurgens has a great handle on Lois, showing her in all her glory. She's a fierce investigative journalist. She's brave. She's willing to dust her knuckles if she needs to. And it is all in the name of truth, justice, and the American way. 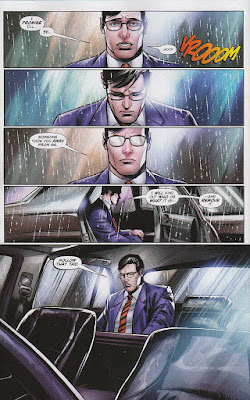 The art is split between Patch Zircher on the Lois/Clark pages and Stephen Segovia on the Superman pages. Both artists put nuances into the pages to really make then visually engaging and complementary to the story. Great stuff! And while I am a fan of Crisis #7 homages, I think this cover by Gary Frank is the third in three months! 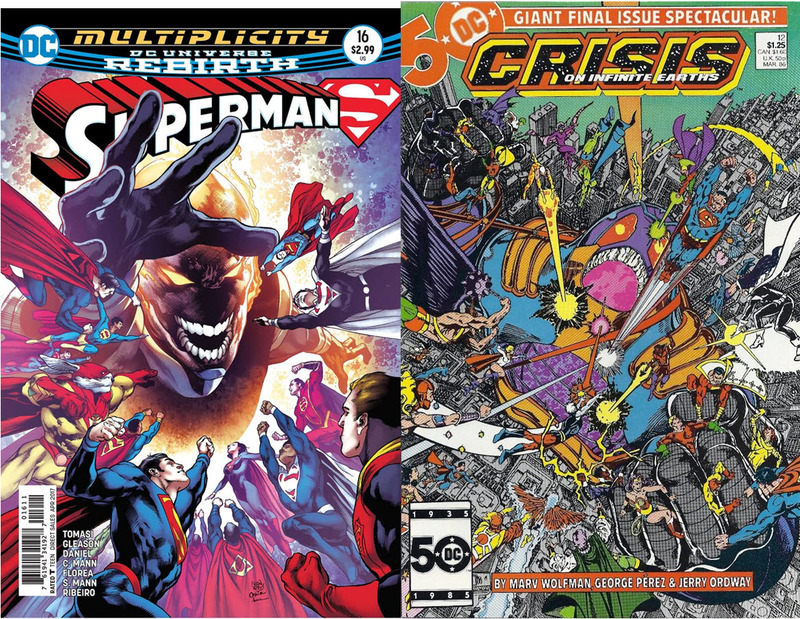 From Doom Patrol to Superman to Action Comics, these are getting to be like ants. 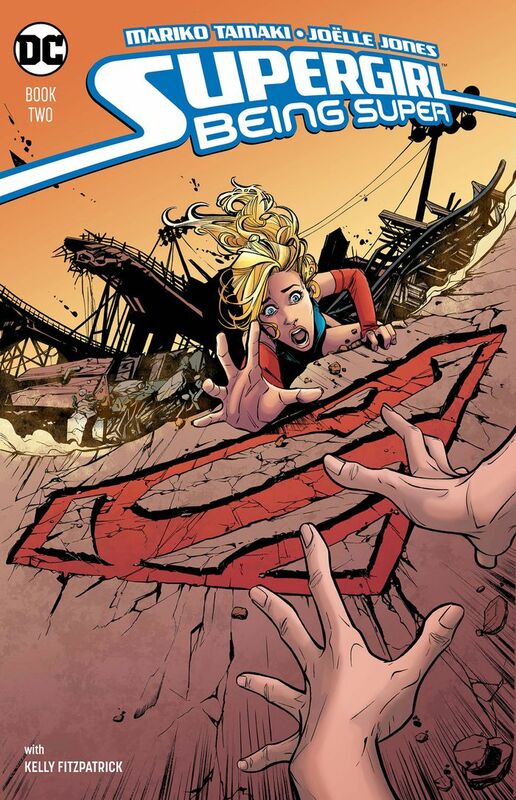 Supergirl #6 came out this week, the end of the first story arc of this new #Rebirth take on the character. And frankly, for me, it was the best issue of the run so far. 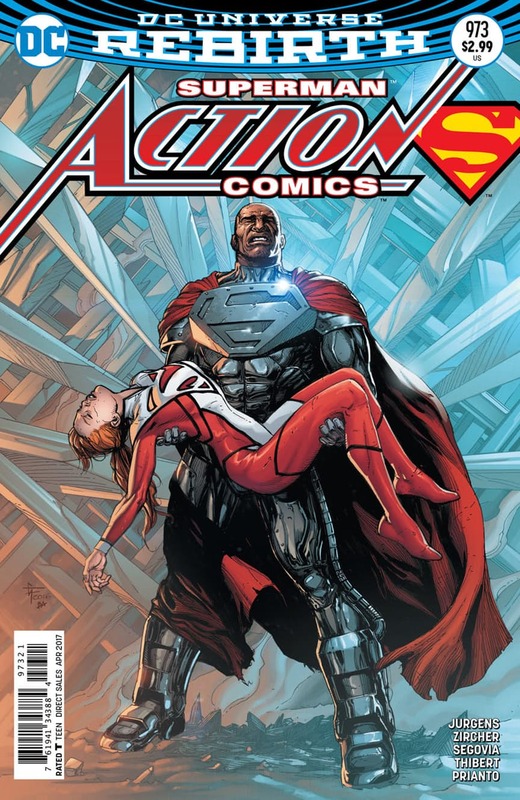 I don't know if I would have started this new run with a Zor-El/Cyborg Superman story. I don't know if I would have had Argo City enter Earth air space. And I don't know if I would have retold yet another story where Supergirl accepts Earth as her home. But there is an old saying about these things. "Don't give the reader what they want. Give them what they need." Writer Steve Orlando wraps up this first storyline in the best possible way. This isn't a reimagining of Supergirl. The foundation of her being a hero who loved Earth, a far cry from the angry loner from the early New 52, had been established by Tony Bedard, K. Perkins, and Mike Johnson. No, this was a reaffirmation of who Supergirl was. A refining of that character. This issue ends on such an upbeat and optimistic tone, in all aspects of Supergirl's life, that I feel as if the true #Rebirth is starting now. We needs to get out of the blocks and get running. But now we are sprinting. The last pages of this book truly encapsulate what I love about the character and I am on board. It helps that Orlando really steeps this book in DC Comic lore. Rather than portray the #Rebirth universe as a reboot, Orlando looks way back, dropping verbal cues and visual images of DC's broad history. Whether it is pre-Crisis, pre-Flashpoint, or pre-Infinite Crisis, it all is in play here. And for a longtime fan like me, that is beyond spectacular. 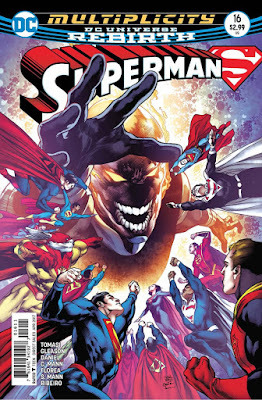 It even starts with the variant cover, the Bengal riff on the classic cover of Superman #233. Brian Ching's art is consistent. There is a lot of energy here and a emotion. But it is the quiet scenes at the end where I think Ching truly shines in this issue. So this was quite the finale. On to the book. We are currently in a time where groups are eager to label anyone different as 'other' and accuse them of villainy and evil. I look out at this country and all I see is hate. And it scares me. No one seems willing to extend a hand, try to understand the other view point, or try to compromise. Both sides are on their side of the river, roots firmly in place, yelling 'No You Move' to the other side. And when neither side wants to move all that is left is revolt. Sorry to open a back issue review with something so morose. 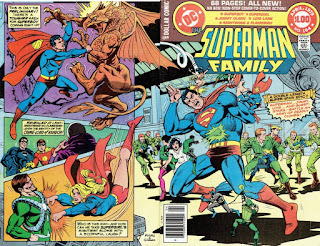 With that concept of labeling and hating someone as other, I thought I would review the Superman Family #194 Supergirl story in which hate is used as a weapon, a weapon that can only be defeated by love. Released in 1978, the Supergirl story is a clear commentary on Stanford Prison Experiment, a psychological experiment done on the Stanford campus in 1971. I do wonder why it took 7 years for the story to come out. I don't know how fresh in the public memory this experiment was at the time of the issue's release. As someone who (I know I am dating myself here) bought this issue off the spinner rack, I certainly didn't know about it. Overall it is a decent if simple story of how the concept of 'the other' and hate can roar out of control. And it will take clear thinking and compassion to defeat it. Supergirl Episode 211 came out this week and was titled The Martian Chronicles. And the name is appropriate because this episode does concentrate on Miss Martian and the White Martian threat. Given the powers of the Martians, the episode is definitely action heavy and plays on some of the beats of the classic John Carpenter horror movie The Thing. (We have seen the Supergirl staff riff on the The Thing in the past in the Parasite episode. And the Despero episode from last season definitely had an Aliens feel to it). So the main plot lived up to the hype. But there are a couple of running themes in this season which this episode continues to build on. Another ongoing thread throughout this season has been one of prejudice. Whether alien immigration or Green/White Martian racism to Cadmus' xenophobia, hate and prejudice has been a strong undercurrent in season two. And furthermore, it isn't just seen in the bad guys. J'onn has had to deal with his own hate and prejudice here and in this episode he really moves forward. And this is great, especially in these days. But, being a comic nerd for some time, the high point was still the super-powered battles. Seeing Supergirl, Miss Martian, and the Martian Manhunter fighting two white Martians was just eye candy! On to the show. Spoilers ahead! It has been a while since I posted pictures of my entire Supergirl collection, instead just showing a snippet of where I have placed a new item. Over the last couple of months, there has been something of an explosion of additions - everything from Happy Meal toys to puzzles from my childhood to statues. With all these new pieces, I figured it was time to show the whole display. Here is the first shelf. This shelf concentrates on Silver Age interpretations, the 70s hot pants costume, and the Crisis headband costume as well. I keep trying to rearrange the shelf so the 'Welcome to Midvale' sign in the background is more prominent. But it isn't easy. The latest piece was the diecast metal Super-rocket in the back. This toy was listed as Superman's rocket. But the occupant looks like Supergirl enough that my family bought it for me. I suppose it could be Kal all cozy in a yellow blanket. But it just as easily be Kara. And hooray for two Streaky's being on this shelf. The middle shelf is concentrates on the white shirt animated costume and most 'full shirt, red skirt' versions of the costume. 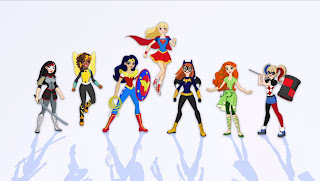 Looking around you might see the bookend Femme Fatale statues and the DC Superhero Girls toys. This shelf also has some of the variants as well - the armored Flamebird Kara, the Elseworld's Finest Kara, and the Lucy Lane evil Superwoman (peeking out from the back right corner). Hooray, a Streaky is here as well! The last shelf has the belly shirt costume and the New 52 costume pieces as well. The shelf also has some 'variants' as well - Ame Comi, Bombshells, and the television show figure. Sometimes I don't think it registers how many pieces are in the collection until I look at pictures like this and describe them. I find it interesting that the belly shirt and the white t-shirt seem to have the most pieces. And I don't think I am done. I have the television show statue ordered, slowly paying it down. My dream pieces include the large version of the Matrix statue in front of the stained glass window and the Superman holding Supergirl Crisis statue. And, I am always on the lookout for new things which catch my eye. Teri Hatcher As The Big Bad! Kevin Sorbo too! Now there is a lot to mull over with this brief news blurb. First off, kudos to Greg Berlanti for bringing in another actor associated with the Superman mythos. We have Helen Slater. We have Dean Cain. Now we have Teri Hatcher. This is all great. And, of course, that could lead to scenes of Hatcher and Cain together. I can only hope that happens, a Lois and Clark reunion! But the big question is who could she be? At first I thought she might be alien in origin, somehow involved with the women chasing Mon-El. Perhaps she is his mother, the Daxamite queen? Maybe she is a major alien baddie like Lady Styx? But I keep coming back to Dean Cain being at Cadmus and the need to Cain and Hatcher to appear together. So I am going to go out on a limb here. I am going to say that Hatcher is the head of Cadmus, even above Lillian Luthor. I'm going to say that Jeremiah is being forced to work for her. And I think she needs to be a threat to Supergirl in all ways. And that can only mean one thing. Superman #16 came out this week, the final chapter of the Multiplicity storyline.I had gone into this arc with high hopes and the first chapters really gave off a grand scale vibe. This had the feeling of a company wide mega-crossover. And that was a bit deflating. Because everything up to this point was just clicking. Writers Peter Tomasi and Patrick Gleason are obviously building to something. We see Mr. Oz in this issue. We hear about this threat coming to all Earths. We know there is an army of Supermen out there. And I have had little to complain about in their run. But I wonder if they were constrained on pages and needed things to end magically to keep a company-wide timeline on track. Art on the book was a mix of Tony Daniel and Clay Mann and the book is pretty lush. I thought the art was very good and continued that feel that this was something grander than a simple issue in a monthly book. Between the cover and the final battle with Prophecy, there was an echo of Crisis on Infinite Earths #12. There was an outright swipe of Crisis on Infinite Earths #7, the image that is always homaged. Or am I just imagining this? 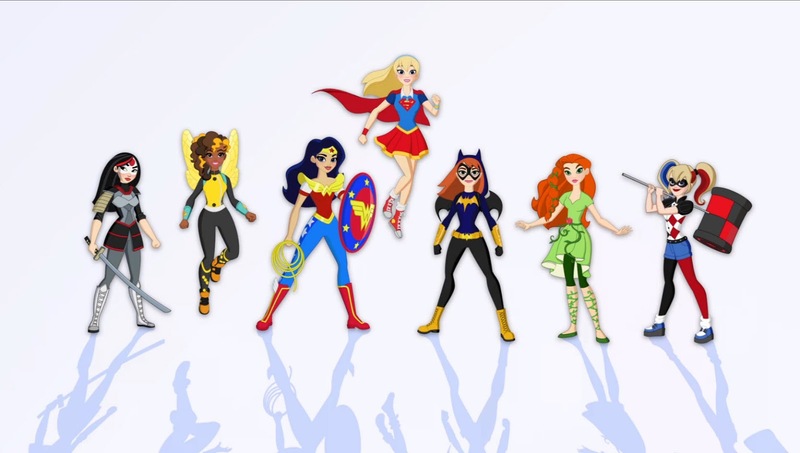 The first two 'seasons' of the DC Superhero Girls video shorts seemed intent on introducing us to the characters and giving us an overall sense of this particular incarnation of the characters. I enjoyed this new universe for what it was, a fun look at the foibles of being a super-heroic high schooler. But with success and a following behind them, as well a couple of feature-length films and graphic novels behind them, it was time to take a step forward. The 'trailer' for the third 'season' makes it seem more like a long form story told in chapters as opposed to humorous one-offs. There are sentient Kryptonite chunks playing with the emotions of humanity. There is a Female Fury invasion. And what looks to be plenty of battles. The trailer really had a sort of Super Friends vibe to it. A last week, the first episode of the season dropped. 'Batnapped' was a nice transition. We definitely get great fun with Batgirl, Supergirl, and Killer Moth!! And we get the seeds of a couple of threads which I think will ultimately bear fruit. As always, I am very happy that this line exists. On to the episode! Supergirl Episode 210, titled 'We Can Be Heroes' aired this week and heralded the return of Supergirl's arch-enemy Livewire. Given the commercials we had seen for this, I thought it would be something of a very action-heavy episode. But instead, we got a character driven show in which several of the show's primaries had to deal with either personal biases or outright misjudgments. This concept of prejudice blinding someone has been a popular theme to tackle on this show right from the beginning. But usually it is the main character's reaction to it, not wading in it a bit themselves. Perhaps the most perplexing plotline in the episode was Kara not wanting to let other less proven people wade into super-hero business. She tries to shelve Mon-El (not trained) and James (not invulnerable) throughout the episode and even moving on. And yet ... you think that Kara of all people wouldn't feel this way. After all, it was in the premiere itself that Alex tries to stop Kara from being Supergirl and it is Kara who still pushes forward on her journey. Supergirl wasn't trained at all but she knew she wanted to help people. It is this hypocrisy which I think is easy grist for the mill moving forward. There is a very good subplot of J'Onn finally having to deal with his own hatred of White Martians as he weighs the pros and cons of helping a dying M'Gann. We get the slightest peek into the deepest part of J'Onn's psyche which shows he is pretty human in his own way. And then there is the Livewire subplot which took a left turn I wasn't expecting. Are villains immutable in their evil ways? Or can they change and redeem themselves? Mixed in all the action were two or three very powerful conversations where characters confront each other in ways that aren't warm and fuzzy. Things aren't always bright in National City. In particular, Mehcad Brooks gets a couple of standout moments which made me say 'wow'. God knows his character needed it. If I have one complaint about the episode it is in the directing. There are a lot of moments of conflict between characters here. And yet the shots are often a closeup of one character's face, sometimes as viewed over the shoulder of another character. I would have loved it if both characters were in the shot so that we could see body language and other cues. These weren't comfortable discussions at times. Let me see that!